We cannot expect ourselves to be able to change overnight. It's a little more than a week into the new year, which means that the resolutions are flowing. If you're anything like me, my resolutions get old fast and barely last until the end of the month. 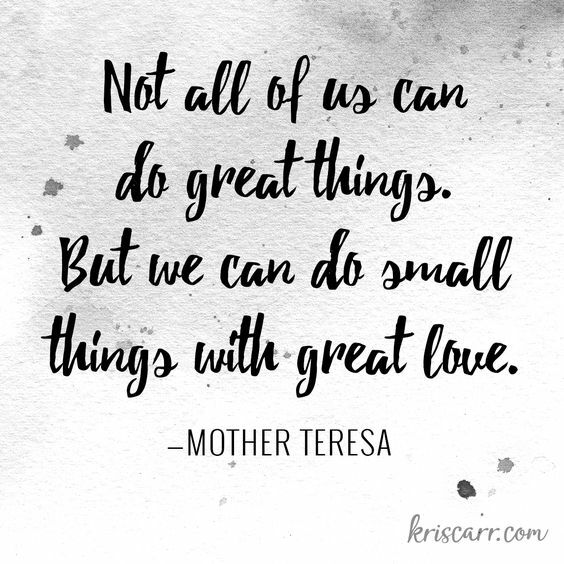 While making the following list, I kept in mind Mother Teresa's quote, "Do small things with great love." Instead of trying to totally change immediately in 2018, I am going to try to do little things over the course of a day, week, month or even the whole year. I think that it is important for people to remember what Mother Theresa said. Remember that change takes time and work. It won't happen overnight and we cannot expect ourselves to be able to change overnight. It is also important to remember that just because a change or action is small, it does not mean that it has any less of an effect on our lives or the lives of another.